The Miracle League of North Mankato started in May of 2007. The Miracle League of North Mankato is unique in that we not only provide a league for children with disabilities, but we also have a league for adults with disabilities. The "Miracle League" is a nonprofit organization, founded in Georgia in 1998, that provides children with mental and/or physical challenges an opportunity to play baseball as a team member in an organized league. The Miracle League gives children an opportunity to get out in the sunshine and enjoy playing baseball in its purest form. The Miracle League of Minnesota (MLMN) is a chapter of the Miracle League organization and provides opportunities for children between the ages of 3-19 with disabilities, to play Miracle League baseball, regardless of ability. 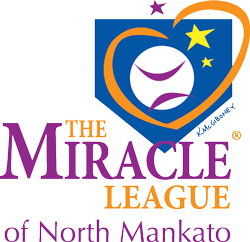 MLMN promotes community support and sponsorship of Miracles Leagues in Minnesota and promotes the construction of special facilities that meet the unique needs of Miracle League players and their families. Visit The Miracle League of Minnesota.